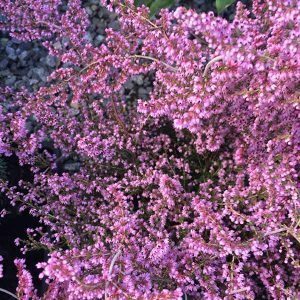 A versatile and hardy plant, Erica are commonly called heath plants. 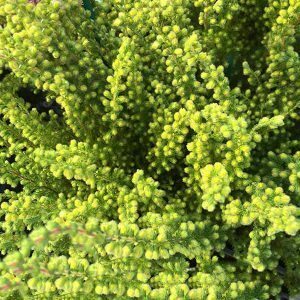 The name comes from the natural habitat, open heaths, and with a low, dense growing habit they are a very useful group of landscaping plants. With good foliage year round, and colorful flower spikes that cover the plants in spring they can be grown in the garden border, containers or planted en mass as a ground cover plant. Ranging from dainty cultivars such as E x watsonii with is low growing habit to the vigorous E x darleyensis cultivars that can reach nearly 1m in height the genus presents a range of plants suited to different landscaping applications. With over 700 species from small shrubs to medium trees Erica are a broad genus. However it is the low growing types that we commonly see in gardens. All species generally prefer well drained soils. 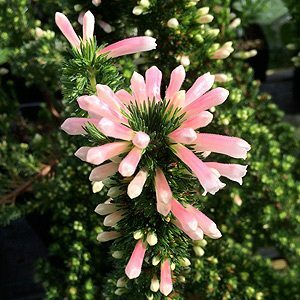 Erica can be grown in pots and are generally a hardy plant. They are also commonly known as Heath. Varieties such as Erica verticillata, baueri, and lusitanica are a heath and with species from Europe and South Africa the varieties and forms of this useful plant is huge. Most species do not like frost. Many cultivars are also available including Erica x ‘Pink Pearl’ pictured right. Erica are not only native to South Africa, species such as E.carnea, E. cinerea, E. x darleyensis and E. tetralix along with many hybrids can also be found in Europe. All species prefer a slightly acidic soil, and this is the key to growing these plants successfully. They also like an open sunny position and a well drained soil. They are best planted in areas where lime has not been added to the soil, and are not overly fond of the addition of manures. E. carnea is one variety that does tolerate lime. All species do like a humus rich moist deep soil and you should dig the area over well before planting. some well rotted compost can be added. Water in well after planting. Although you can leave plants for a number of years without pruning, for best flowering and growth habit. Most Ericas are best pruned annually, however some rarely need to be pruned and others do not respond that well at all. E.carnea – Generally does not require pruning, however can be lightly pruned after flowering to maintain size. E. erigenea – Another that rarely requires heavy pruning. E x darleyensis – These are the hybrids that most gardeners grow and they are vigourous. We recommend that they be pruned annually to maintain shape and flowering vigour. They are easy to prune and you can use an electric hedge trimmer to prune them immediately after flowering. E. cillaris – Hard prune in early spring if you with to prolong the flowering season or immediately after flowering. E.cinerea – Hard prune in early spring if you with to prolong the flowering season or immediately after flowering. E.vagans – Hard prune in early spring if you with to prolong the flowering season or immediately after flowering.